We have gotten many requests for projects involving fiber optic communications for science fairs, K-12 science classes and scout projects. We thought we'd share with you the project we developed for our own kids in the Scouts and has been used in several science fairs. It is a fiber optic telegraph that sends signals as light and can send Morse code. The project uses plastic optical fiber (POF) which has a larger core than glass fiber ( ~1 mm ) and transmits light best at 650 nm, or bright red light so it is easily visible. Our project uses a small red LED (available from electronic hobby stores like Radio Shack or online) driven by a 9V battery. 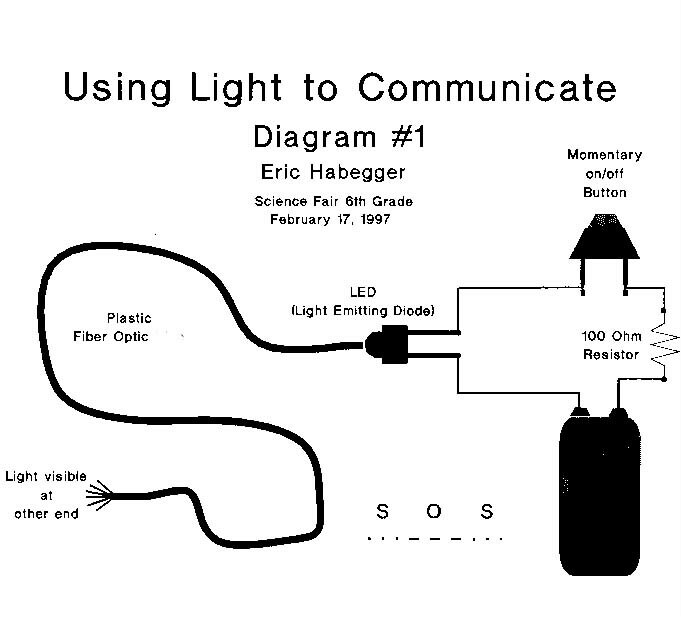 The diagram was drawn by Eric Habegger who contacted us for help through this web page, used our idea for his project, then drew this diagram on his computer. The 100 ohm resistor limits the current through the LED and the momentary contact switch provides a means of modulating the LED light by turning it on and off. If you choose the smallest LED, a piece of plastic tubing (about 3/32 inch inside diameter, available from hobby shops where they sell model airplanes) slipped over the LED and the end of the fiber makes a easy way to hold the LED firmly against the end of the fiber. Tape wrapped around them can also be used. If you have an electronics bent, build a transmitter receiver instead of using your eye and transmit audio or digital signals. Web search "LED transmitter" and "transimpedance amplifier for photodiode" for circuit designs. You can buy most of the materials at Radio Shack or any electronic hardware store. If you can't find the POF itself, buy an inexpensive "TOSLINK" cable used for CD and DVD players and cut off one of the connectors. And feel free to send us email if you have questions. Teachers: see our free online PPT presentation - an introduction to fiber optics or view a similar presentation on YouTube. (c) 2002-12, The Fiber Optic Association, Inc.